This car drove in the UK with the registration number AFM 407A, and as far as I can see the car has always been red coloured. I am trying to complete the history file of this car as much as possible, so any readers that can be of any help, please contact me. In the meantime I will get in touch with the DVLA to see if they can inform me about the former owners of the car. Also, I will get in touch with some classic car magazines, perhaps one of their readers can be of any help. The taxdiscs that came with the car show that this Grantura drove in the Chadderton Oldham Lancs area, which is not very far from Blackpool. The car had its last taxdisc bought in 1990 to use in 1991. On the 12th of November 1990 however, the car was sold to a Dutch based company, Ron van Hamersveld auto’s in Lelystad, by the Brighton based company called Sporting Cars of Brighton. How long Sporting Cars of Brighton had the car already in their possession is hard to find out, the company no longer exists. From the Dutch company Ron van Hamersveld auto’s, the Grantura went probably to another Dutch company, called Stoutjesdijk Auto’s in Soestdijk. This company sold the Grantura finally to a certain Mr. Roosingh in Lochem, who enthusiastically started the restoration. Mr. Roosingh even made a complete new chassis for the car, though the pipes have the wrong thickness, which makes the new chassis a bit heavier. 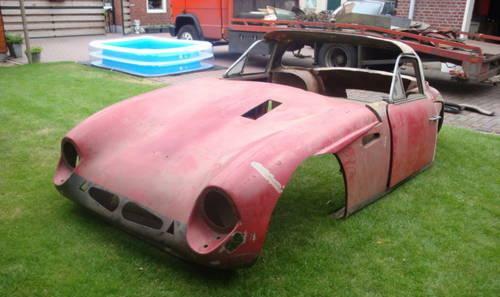 We’ll have to see if this chassis can be used, depending on weight and measurements..
Mr. Roosingh stripped the Grantura during the restoration process completely and finally sold the car this year to another specialist, this time in American classic cars, Antoon Reuvers. From this person I’ve bought the Grantura, still in many pieces, but apart from the original engine (Ford 100E with Shorrock Supercharger) and gearbox, it’s complete. Target now is to get as much information as possible and fortunately I have got in contact with several Grantura MK1 owners who can help me along with the restoration, which could save loads of troubles and unnecessary costs when you have to find everything out from scratch. The plan is to start in spring 2013 with either the newly build chassis that came with the car (dimensions and weight have to be exactly compared), or restore the original chassis that is also still with the car but in a very bad condition, even probably beyond repair.